Well, I don’t know about that. 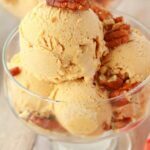 Because I think ALL the vegan ice cream I’ve made so far have been totally divine! But this one is really good. 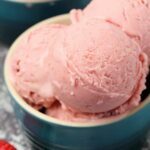 It’s also no churn, so for those who don’t have an ice cream maker, it’s totally ideal! It couldn’t be easier to make this either. 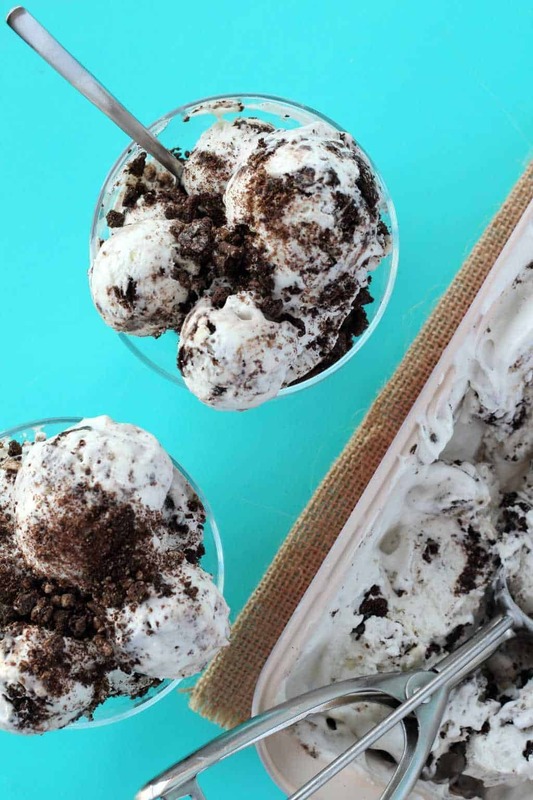 You whip up a double batch of coconut whipped cream. So if you’re using regular cans of coconut cream, you would chill two cans in the fridge (at least overnight) and then scoop out the hard cream that rises to the top, leaving the watery part behind. 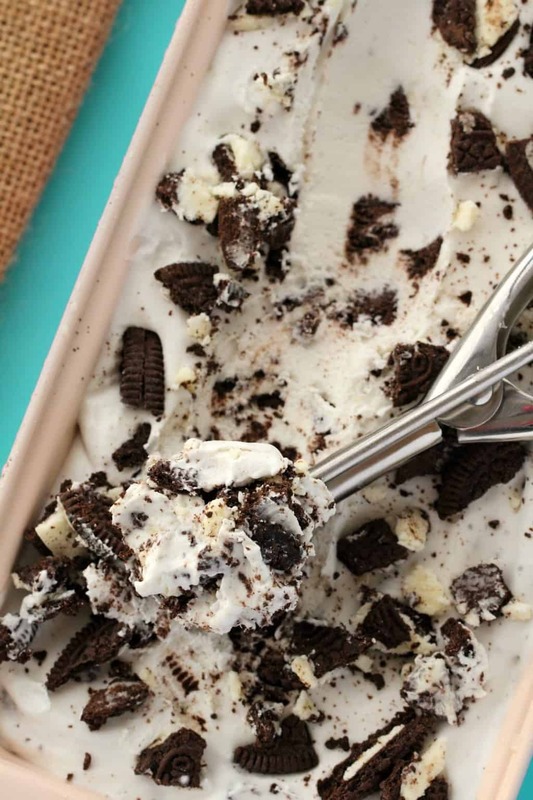 Whip it up in an electric mixer until it’s nicely whipped. This is easiest to do when your cream is nice and hard to start with. If it’s quite floppy to start with, then it can take much longer. Alternatively you can use one full can of coconut whipping cream. 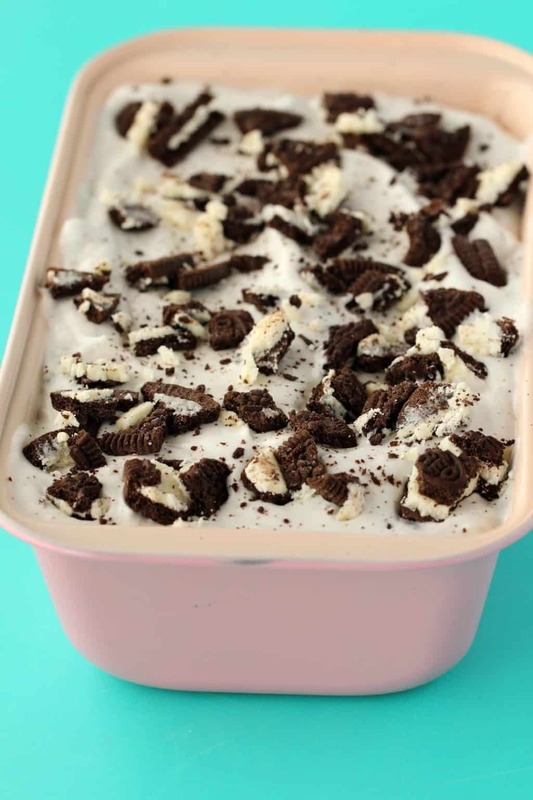 This also has to be chilled overnight but it doesn’t separate, so you don’t throw anything out so you can use one can instead of two cans of regular coconut cream. 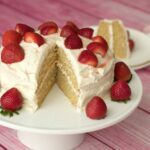 You pour out the entire can of chilled coconut whipping cream into your electric mixer and go for it, and within 2-3 minutes it is thick whipped cream. 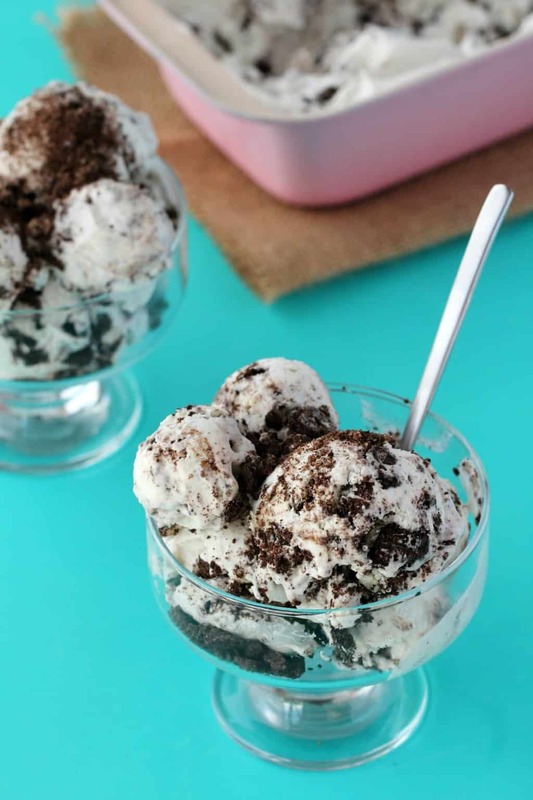 The next ingredient in this vegan cookies and cream ice cream is one full batch of homemade vegan condensed milk. This makes around a cup and a half, so if you’re wanting to use a store-bought readymade vegan condensed milk, then you can just use one whole 14oz (400ml) can. 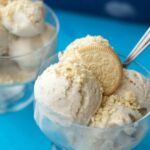 The final ingredient in this easy no-churn vegan ice cream is sandwich cookies! I used oreos, which are definitely vegan where I am (if you’re not sure, just read the ingredients on the box), but you can go ahead and use any vegan sandwich cookie that you like. I broke them into pieces by hand, rather than crushing them in a food processor, as I wanted it to be nice and chunky, I didn’t want cookie crumbs I wanted cookie chunks. So breaking them up into pieces yourself is the best bet. Fold the cookies into the mixture, pour it out into a loaf pan and add some more cookie pieces on top. Freeze. And that’s it! The ice cream itself is gluten-free, but the cookies I used are not. But if you want this to be gluten-free then use a gluten-free vegan sandwich cookie and you’ll be styling. 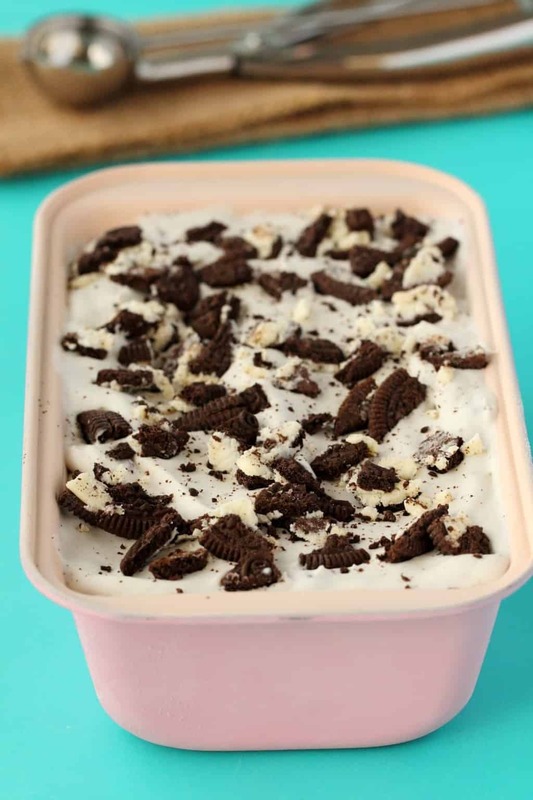 The texture of this ice cream is really fantastic, it’s ultra smooth and creamy. I find it a tiny bit more ‘dense’ than ice creams made in an ice cream maker. 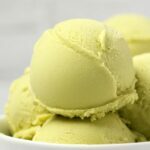 The churning from the ice cream maker incorporates more air to create a slightly ‘lighter’ texture. 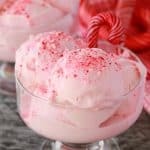 But, the main ingredient, being coconut whipped cream, has already incorporated air while whipping so it still works in that respect, so the slightly more dense nature of this ice cream doesn’t do it any harm. It’s best consumed within a week, though of course it lasts longer than that, it’s frozen after all. It’s just that ice crystals can start to form if you keep it too long. 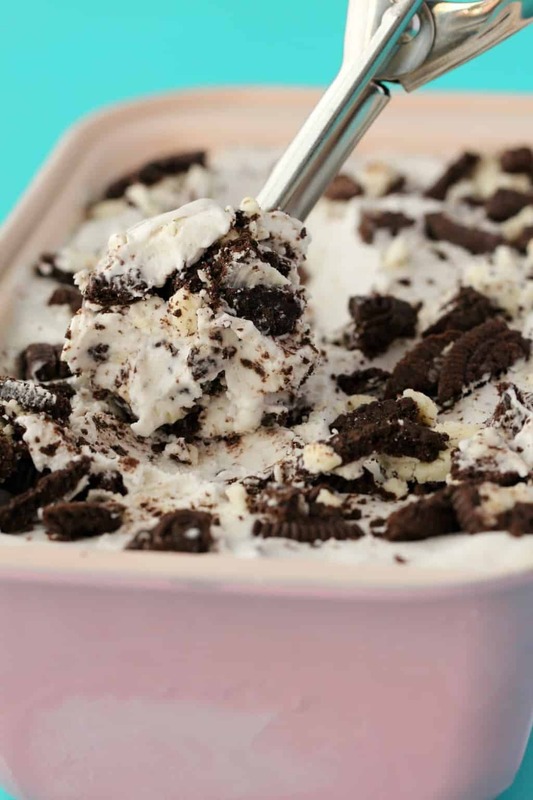 But let me be honest, sometimes I forget that I even have ice cream and weeks later it is still totally delicious! But it’s still at its best in the first week. 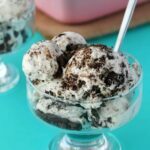 So please let me know what you think of this no-churn vegan cookies and cream ice cream and if you have any questions fire away. 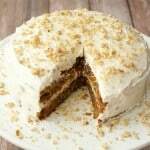 Please rate the recipe too as that helps us so much. Thank you! Sign up to our email list for a free dinner recipes ebook and to stay updated with all our latest recipes as they’re posted to the blog. 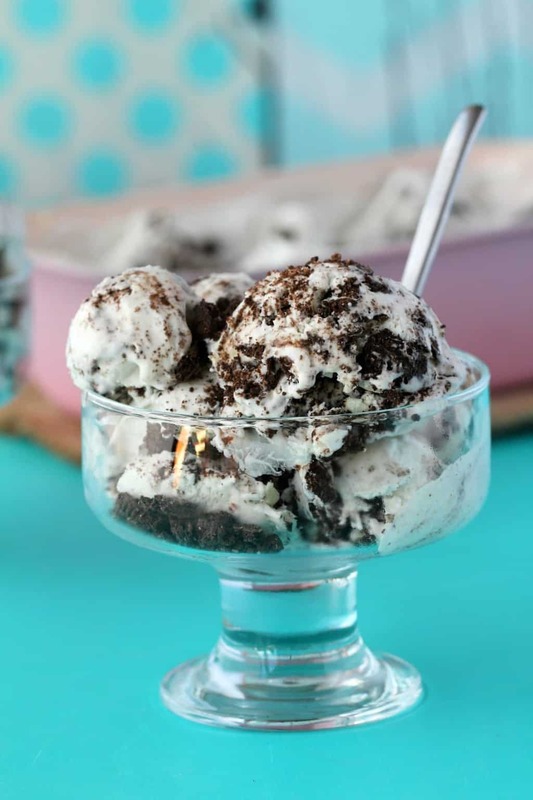 Smooth and creamy vegan cookies and cream ice cream. 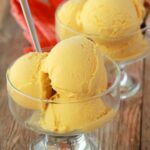 This no-churn vegan ice cream is only 3-ingredients and super easy to make, with fabulous results. Chill your coconut whipping cream or cans of coconut cream at least overnight in the fridge. If you’re using coconut whipping cream, pour the entire can into the bowl of an electric mixer and whip for 2-3 minutes until you have perfect whipped cream. If you’re using regular coconut cream cans instead, then take the two cans out of the fridge, the hard cream section will have risen to the top. Scoop out only this hard cream section from both cans into the bowl of your electric mixer. Throw out the water that’s left behind in the cans. 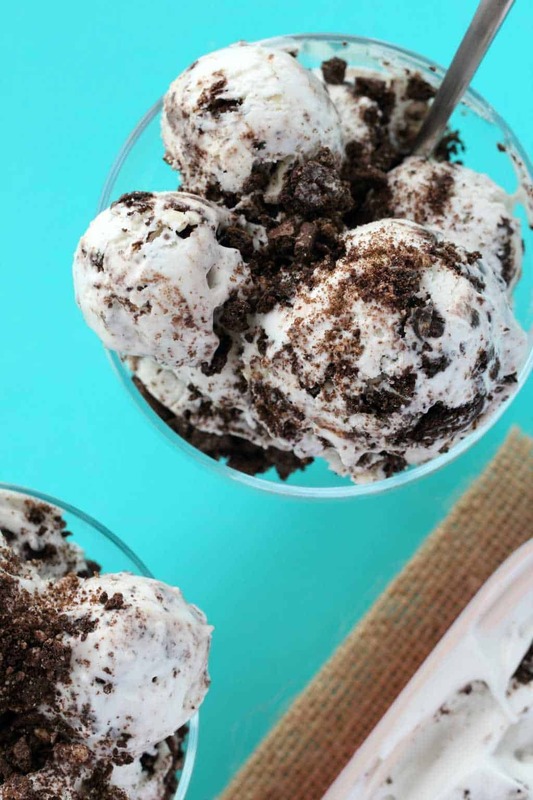 Whip this up until you have perfect whipped cream. Place into the fridge while you make your vegan condensed milk. Prepare your homemade vegan condensed milk by adding all the ingredients to the blender (as per linked recipe) and blend it up into perfect condensed milk. Add the vegan condensed milk to your whipped cream and mix in. 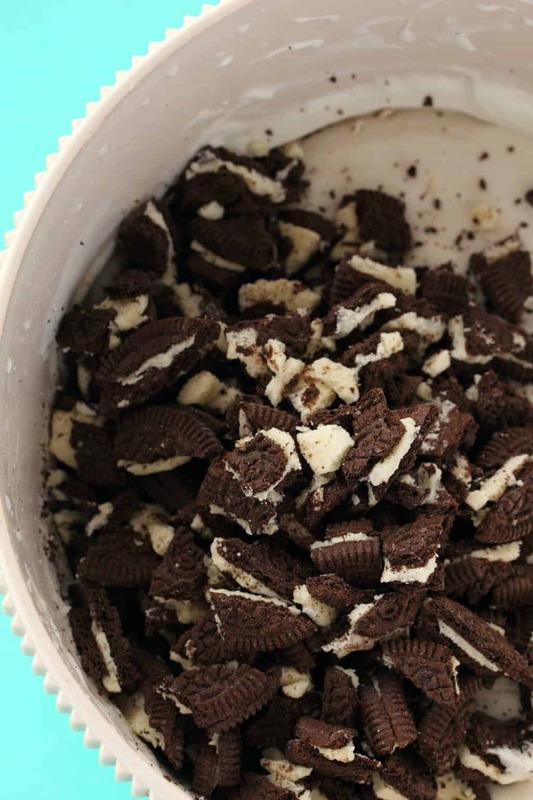 Take 12 of the oreos or other vegan sandwich cookies and break them up into pieces and add to the mixing bowl and fold them in. 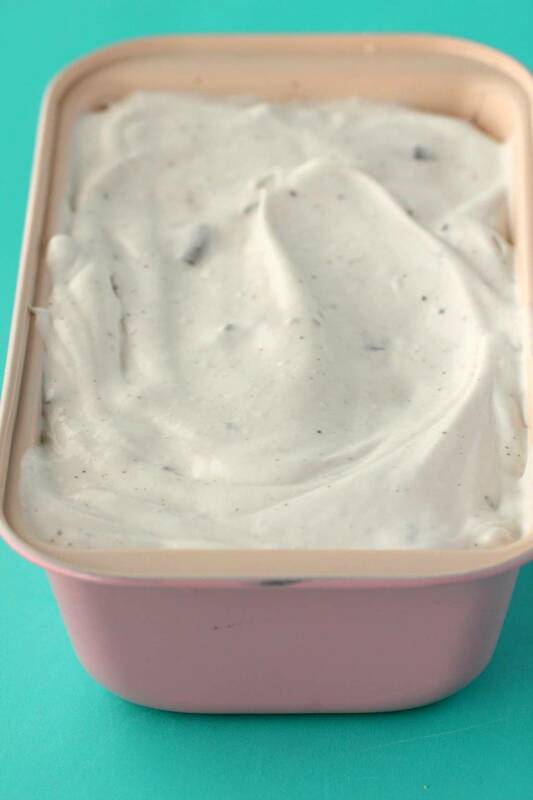 Transfer the ice cream mix to a loaf pan and smooth down. 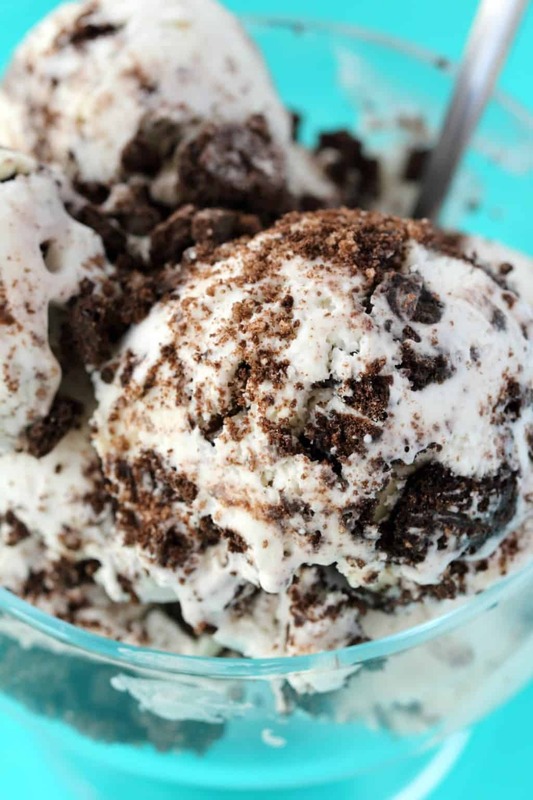 Take the remaining 4 oreos or vegan sandwich cookies and break them up over the top of the ice cream. 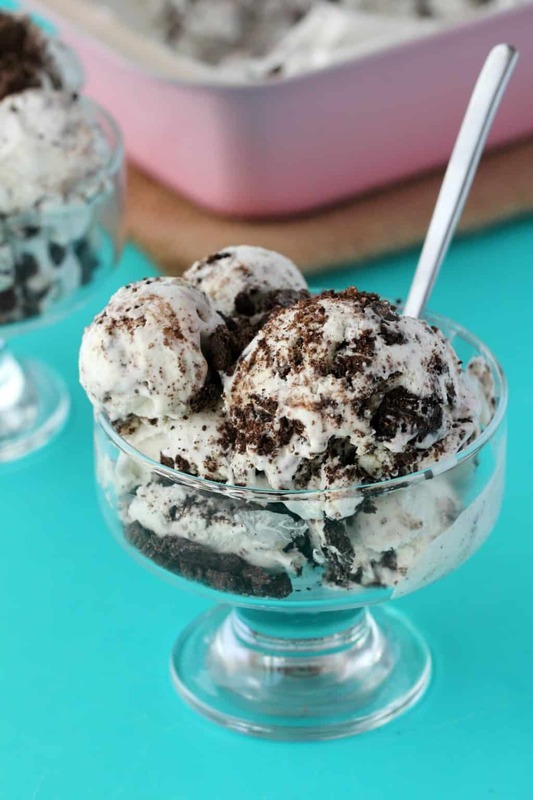 When you want to serve the ice cream, let it thaw for 5 minutes or so on the countertop and use an ice cream scoop dipped in hot water to scoop it. *The reason you only need to use 1 can of coconut whipping cream instead of 2 cans of regular coconut cream is there is no waste with coconut whipping cream, you whip up the whole can. Whereas with regular coconut cream, you only use the hardened cream section that has risen to the top and throw out the water left behind. 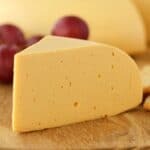 *The homemade vegan condensed milk makes about a cup and a half of vegan condensed milk (360ml) but if using a store-bought readymade version, you can just go ahead and use a full 14oz (400ml) can. It looks amazing and I can’t wait to try it. 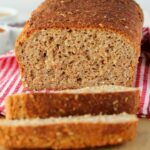 Is there any other vegan alternative besides coconut please? Lil one reacts to it.